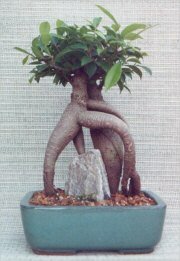 Ficus Retusa - Also known as Banyan Fig and Taiwan Ficus. Elongated, light green leaves have a striking resemblance to the popular weeping willow tree. The Retusa has small dark green leaves which alternate up the stem and which are more oval than the Benjamina. Grey to reddish bark dotted with small horizontal flecks, similar to tiger-like markings. All have heavy trunks with exposed aerial roots.